Wheatgrass, a nutrient-dense grass in the wheat family, is commonly sold as dietary supplements or added to smoothies because of its high concentration of vitamins and minerals, as well as potential health benefits. Instead of paying for costly commercial wheatgrass supplements, try growing your own wheatgrass and making homemade wheatgrass juice to reap health and nutritional benefits. Juicing your own wheatgrass is simple with the right ingredients and equipment. Rinse wheatgrass thoroughly to remove dirt. Cut wheatgrass from sprouts and roots with scissors. On a cutting board, chop the wheatgrass into small pieces with a knife until you have 1/2 cup in volume. Blend the wheatgrass pieces with water in a blender on high speed for about 1 minute. Strain solid grass pieces and pulp with a cheesecloth-lined mesh strainer. Push down on the pulp with a spoon to strain extra juice. Add lemon juice to wheatgrass juice to enhance flavor and preserve juice. Use a wheatgrass juicer instead of a blender. Use a mortar and pestle instead of a blender or wheatgrass juicer, and use 1/2 cup of water instead of 1 cup of water. Add 1 tablespoon of honey or carrot juice to wheatgrass juice instead of lemon juice. Use coconut juice or orange juice instead of water. Mix wheatgrass juice with your favorite fruit or vegetable smoothie. It's best to drink wheatgrass juice immediately after preparing it, but not everybody has the time to juice wheatgrass daily. If this is the case, store wheatgrass juice in airtight containers in the refrigerator if you're going to drink it the same day, or in the freezer for up to one year. You can freeze wheatgrass juice in ice cube trays, as long as you seal the cubes in airtight containers. Juicing wheatgrass may provide you with several health benefits. A 2015 review published in Mini Reviews in Medicinal Chemistry reports wheatgrass appears to have anti-cancer properties, helps boost immunity, reduces chemotherapy-related side effects, and benefits patients with rheumatoid arthritis, diabetes, obesity, ulcerative colitis, oxidative stress, and hematological diseases. Wheatgrass juice may also help reduce your appetite, which can help you shed pounds if you're overweight or obese. Nutrient-dense wheatgrass provides you with a variety of essential and other beneficial nutrients. These include vitamin A, vitamin C, vitamin E, iron, magnesium, calcium, potassium, amino acids, chlorophyll, and flavonoids. A 2-ounce serving of wheatgrass juice contains about 15 calories, 1 gram of carbohydrates, and 1 gram of protein. This superfood is free from dietary fat, cholesterol, and sodium. While the 2015 review in Mini Reviews in Medicinal Chemistry observed no adverse side effects from consuming wheatgrass in research studies, some people may be sensitive to it. Mayo Clinic reports wheatgrass might cause anorexia, nausea, or constipation in some people, and if you're allergic to grass or wheat (or have gluten intolerance or Celiac disease), you may be sensitive to wheatgrass. Mayo Clinic also warns to check with your doctor before taking wheatgrass supplements, and to avoid wheatgrass if you're pregnant or breastfeeding. Wheatgrass may sometimes be contaminated with mold or bacteria, so wash it thoroughly before eating it raw and check for visible signs of mold. You may be wondering why you should go through the extra time and effort to juice wheatgrass. While it's important to check with your doctor before regularly consuming wheatgrass juice, many potential health benefits exist, and this superfood is packed with nutrients. 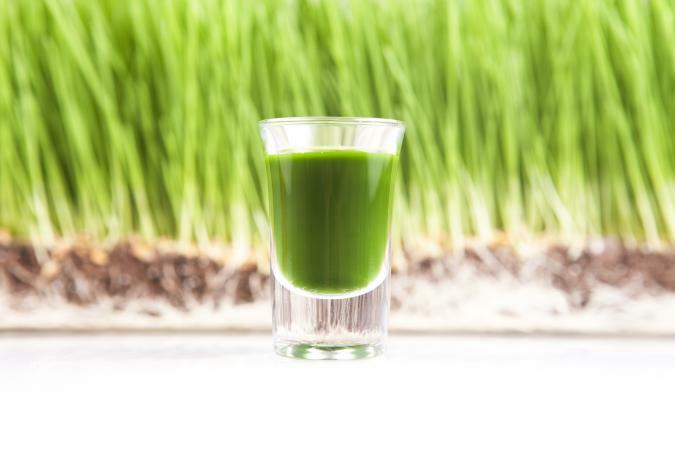 Growing and juicing your own wheatgrass is a cheap way to reap health benefits.